DONATE to support the women of Berd. HDIF's handicrafts bring Armenia’s rich cultural traditions to life. Hailing from more than 10 regions of the country, our producer partners make high quality products with unparalleled skill and talent. Thanks to HDIF’s initiative, vibrant handicraft enterprises have emerged throughout Armenia and our artisans, who are mostly women, are employed in rewarding jobs. We empower local artisans by providing fairly paid, good quality, local employment for women (and some men) in Armenia's rural regions. HDIF pays approximately 20% above Armenia's minimum wage. The money they earn provides supplemental household incomes to support families, send kids to school, and live a more stable life. HDIF products are known and recognized around the world. Each product is a one-of-a-kind creation, made with loving care. The beautiful handicrafts are distinct because of their professional quality and careful attention to detail. Imbued into each piece is the story of Armenia and its ancient heritage. Our goal is to stimulate economic development in rural areas to create sustainable communities. We offer training workshops that teach business skills, financial management, marketing, and community-based tourism. HDIF partners with other organizations to fulfill our mission. When you purchase a product from HDIF, you are getting a unique, handmade treasure that can be cherished for years to come. What’s more, buying HDIF products at a fair price promotes sustainable development. By supporting Armenia’s talented artisans, you are helping them earn a living while stemming the flow of migration to Russia and other foreign countries. HDIF is the first and only organization in all of the former Soviet Union to receive WFTO Guaranteed membership status. We carefully abide by all ten principles of fair trade. The WFTO Guaranteed System ensures that HDIF is in compliance with the global Fair Trade Principles and the WFTO Fair Trade Standards. The World Fair Trade Organization guarantees that HDIF is a Fair Trade Organization. HDIF’s illustrious founder, Tim Straight, lives and breathes global social enterprise. 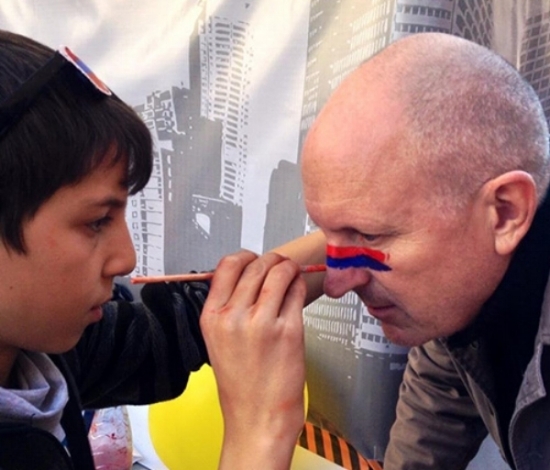 Though originally from Ohio (USA), he has made Armenia his home for nearly 20 years. Tim uses social media to spread the word about HDIF, and his famous video clips have garnered HDIF fans far and wide.